Simon & Schuster, 9781451667110, 336pp. 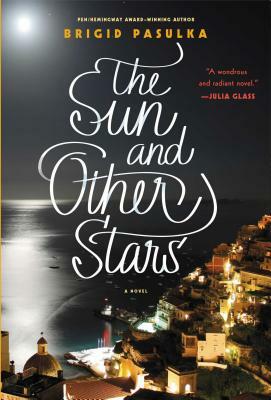 Brigid Pasulka’s PEN/Hemingway award-winning debut novel was compared to the works of Jonathan Safran Foer by the New York Times and hailed by Elle as “storytelling that gets under your skin and forces you to press copies into your best friends’ hands.” Now The Sun and Other Stars, Pasulka’s extraordinary second novel, is all that and more: a profound, compelling, and big-hearted masterpiece that showcases an exquisite writer at the joyful height of her talents. In the seaside village of San Benedetto, a resort town on the Italian Riviera, twenty-twoyear- old Etto finds himself adrift. Within the past year, Etto has not only lost both his twin brother and his mother, but in his grief has become estranged from his father, the local butcher. While his father passes the time with the men of the town in the fine tradition of Italian men everywhere—a reverential obsession with soccer—Etto retreats ever further from his day-to-day life, seeking solace in the hills above the town. But then a Ukrainian soccer star, the great Yuri Fil, sweeps into San Benedetto, taking refuge himself from an international scandal. Soon Yuri and his captivating tomboy sister Zhuki invite Etto into their world of sport, celebrity, loyalty, and humor. Under their influence, Etto begins to reconstruct his relationship with his father and, slowly, open himself back up to the world. Who knows: perhaps the game of soccer isn’t just a waste of time, and perhaps San Benedetto, his father, love, and life itself might have more to offer him than he ever believed possible. The Sun and Other Stars is a gorgeous, celebratory tale about families, compromise, and community, and about how losses can be transformed into hope. Irresistible and unforgettable, it is a shimmering miracle of a book. Brigid Pasulka’s debut novel, A Long, Long Time Ago and Essentially True, won the 2010 Hemingway Foundation/PEN Award and was a Barnes & Noble Discover Great New Writers selection. Pasulka currently lives in Chicago with her husband and son and runs the writing center at a public high school. Visit her website at BrigidPasulka.com. "Read and savored slowly, it is akin to those long, hot summer days Pasulka so vividly captures. Full of light and surprising grace, it is both a poetic coming-of-age story and a poignant examination of the nature of family and belonging." "[A] celebration of young love, sunshine and la dolce vita..."
"Poetic... A beautiful story rich in detail and authenticity." "What The Art of Fielding did for college baseball, The Sun and Other Stars succeeds in doing for pickup soccer." "[A] heartwarming second novel from award-winning writer Pasulka. . . [She] scores a refreshing success with her affectionate portrait of a small-town community and her fresh angle on an aching heart." "The Sun and Other Stars bursts with a Mediterranean ease and exuberance... energetic and carefree, reminiscent perhaps of Dave Eggers or Salman Rushdie." "With a magician's sleight of hand, Brigid Pasulka once again conjures up a stunning chorus of characters. . .The Sun and Other Stars is storytelling at its best, and Pasulka has made magic with this wise, poignant tale of love, community, and the sport that brings them all together!" "Resonant moments. . .appealing characters and keen observations."